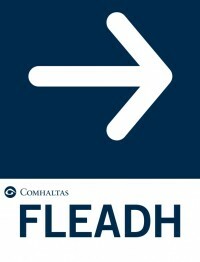 Directional signs with alternative arrows have been developed to assist in the promotion and accessibility of Fleadh events. It is recommended to print signs at minimum A4 size or larger. eg. A3, A2. Place signs where drivers may require directions at intersections and junctions. Place signs right up to the front gate or drive, do not assume people will see the correct building. Consult with Local Authorities on placement of signs and observe health and safety guidelines for placement and removal of signs. Do not obstruct road signage. We hope these guidelines and more importantly the signs are helpful to you when planning your Fleadh.